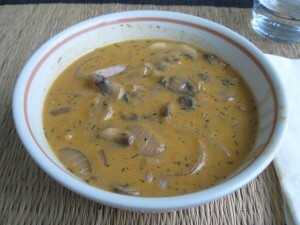 Periodically in Blue Palate I will share recipes – my Blue Palate Specials. Whether they’re old favorites or new experiments, they will always be affordable and usually include healthy adaptations. My first Blue Palate Special falls into the experimentation category. While Hungarian Mushroom Soup is simple to make and one of my all time favorites, my first attempt was this morning, (again) inspired by the blanket of white outside my kitchen door. Melt the butter in a medium soup pot. Add onions and saute until soft. 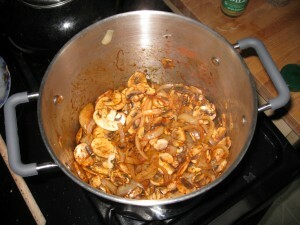 Add mushrooms, saute 2-3 minutes. Add paprika, dill, and salt. Stir until vegetables are coated. Add lemon juice and sherry and cook for 5 minutes, stirring often. Gradually stir in flour, one tablespoon at a time. Add broth and reduce heat. Let simmer for 15 minutes. Coat the mushrooms and onions with the spices. Slowly stir in the milk and black pepper. Add more salt if needed. Add sour cream and whisk, making sure not to let the soup come to a boil. Heat at low temp until hot. Serve with crackers (I love Ak-Mak) or crusty bread. We had our soup with Ak-Mak crackers. It would go great with a hunk of crusty bread and butter, too. I like this recipe because it’s not too rich. Some versions leave you feeling like you just drank a pint of heavy cream. Rather than cream being the dominant flavor, the savory mushrooms stand out an you’re allowed to experience the subtlety of paprika and dill. Like most soups, this one was better the second day. Previous post: Snowstorm? Let’s eat.